I was lucky enough to be a guinea pig and accomplice in Project Octopus. 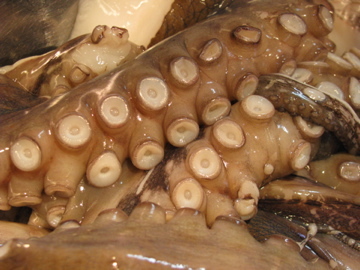 Octopi are something I haven’t given much thought to as a foodstuff. My experience with them has been mainly through sushi where I find them to be overly chewy and not worth the effort. But Bear had been eager to try a recipe for octopus confit since he had discovered it in The New Spanish Table by Anya von Bremzen and I have to admit I was intrigued. 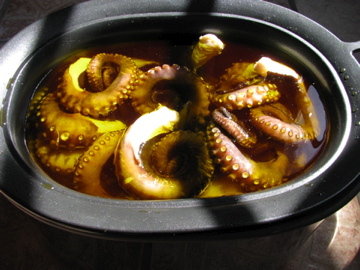 The recipe involved slow cooking the octopus in olive oil for serveral hours. Interest piqued, it was just a case of finding an octopus. We looked in a couple of Asian markets to no avail but one night out taco trucking we found a likely looking specimen at La Michoacana on Morse Road. Actually, we were a little skeptical about its provenance but we took the plunge and brought Ernie, our 2lb, 8 armed friend, home somehow convincing the novice truckee accompanying us that he was still alive and might pounce on her at any moment. Our first attempt at octopus confit managed to pervade the whole house with a pungent fishy odor, but other than that it was deemed a success and was so tender that you hardly believed it was octopus. With some lessons learned about odor control (namely use a slow cooker, plug it in outside and keep the door shut), we felt ready to unleash our new found delicacy on a wider audience and returned to la Michoacana for more octopus. 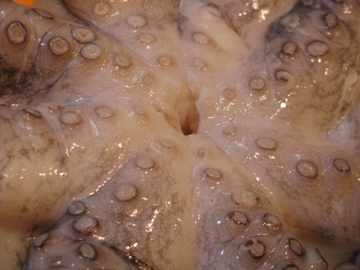 Take your octopus (2-3lbs) and make sure it is completely thawed. It should of course have 8 arms, although one of ours was an amputee and only had 7.5. Comment on how the octopus suction cups reminds you of Lego. With a sharp knife remove the head, beak and then seperate the arms. Blanch the arms in boiling water for 2 minutes, this causes them to coil up (I wish I had a video clip) and the flesh becomes more dense and rubbery. 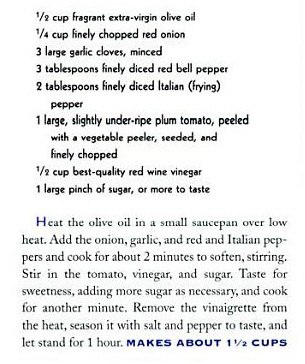 Dry the arms and then put them into the preheated olive oil (250ºF) either in the oven or in a slow cooker. 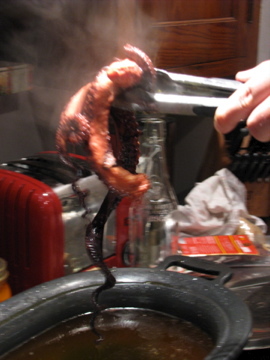 Six whole peeled garlic cloves had been added into the oil and this infuses a garlic flavor into the octopus. The octopi should be covered by the oil but they will move around and also shrink as they cook. I should add that you need A LOT of olive oil. 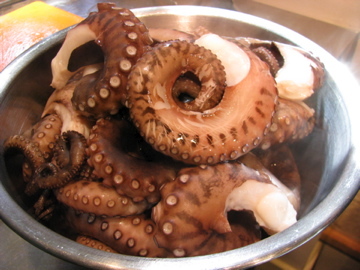 Then leave them to slow cook for 3-4 hours (depending on the size of the octopus) and how tender you want it. 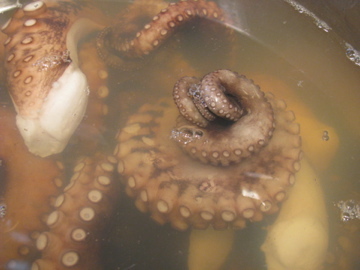 Remove the octopus from the hot oil and allow to drain. Chop it into smaller pieces and serve it with saffron infused potatoes, arugula and a sofrito vinaigrette made with finely chopped red peppers. 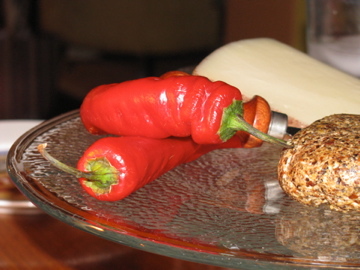 We used Jimmy Nardello Sweet Italian Frying Peppers (which are an Ark of Taste Product) and Round of Hungary Peppers both from Honeyrun Farm (via The Greener Grocer) They look like they will hotter than hell, but they are sweet and light and have no heat at all. Voilà, the finished dish: Octopus Confit and Saffron Potato Salad. A delicious combination of flavors with succulent garlicky octopus, subtly spiced potatoes, a tangy dressing and spicy arugula to cut the richness of the olive oil. Definitely a world away from the rubbery white octopus you find atop nigiri. 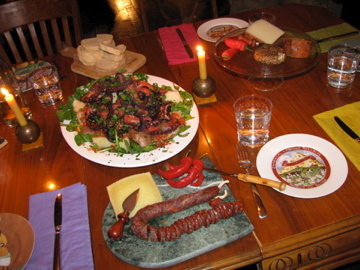 Add friends, great wine, Spanish cheese and chorizo and you have the makings of a wonderful dinner party. Many thanks to B&C, hosts, chefs and instigators of many exciting food adventures and discoveries. There was actually an article in the Columbus Dispatch about buying octopuses in Columbus. The sports columnist wrote the article because Detroit fans throw octopuses on the ice as a celebratory taunt. Thanks. 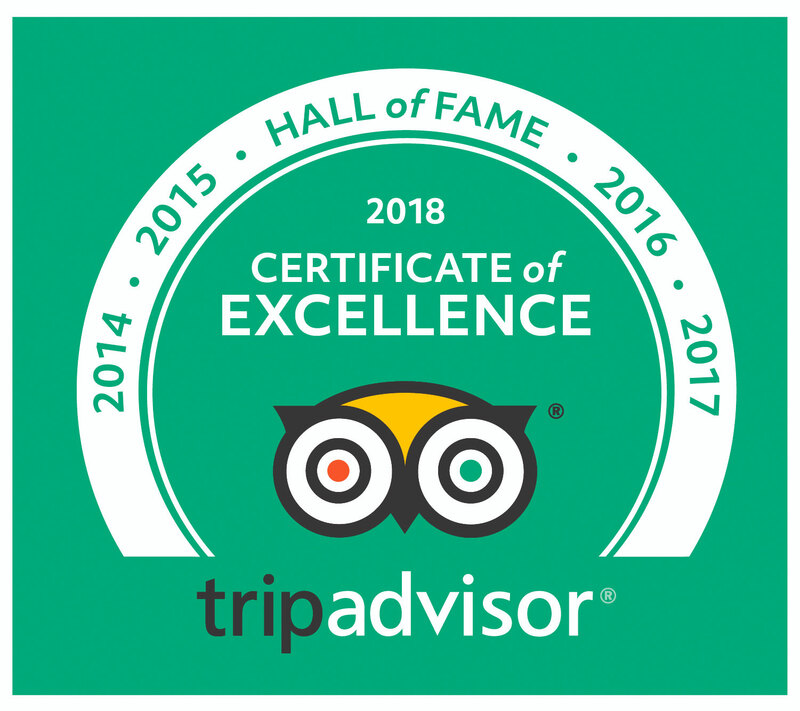 I hadn’t seen that article and I didn’t know about Frank’s Fish & Seafood Market – I’ll have to go and check that out sometime. THe North Market is my usual place to buy fish. Amazing! I was just looking paging through von Bremzen’s cookbook this morning and my eyes fell upon this recipe. 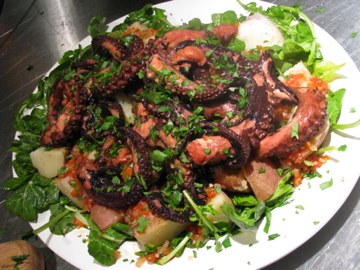 I ate octopus and potato salad often when I visited Croatia this summer, and the recipe looked similar. It’s good to know that it works well and tastes delicious! Wow, this looks incredible, and challenging! 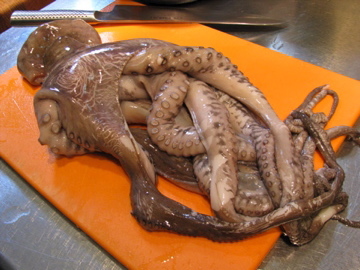 I love Octopus but am slightly intimidated by the thought of cooking it myself. You may have inspired me to try. Congrats on mastering the octopus!